Maryland has a number of major and minor professional sports franchises. 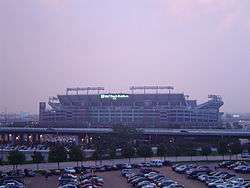 Two National Football League teams play in Maryland, the Baltimore Ravens in Baltimore and the Washington Redskins in Prince George's County. 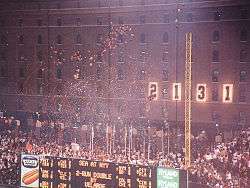 The Baltimore Orioles compete as Major League Baseball franchise in Baltimore. Other professional sports franchises in the state include five affiliated minor league baseball teams, one independent league baseball team, the Baltimore Blast indoor soccer team, two indoor football teams, two low-level Basketball teams, three low-level outdoor soccer teams and the Chesapeake Bayhawks of Major League Lacrosse. The Congressional Country Club and Aronimink Golf Club have hosted several professional golf tournaments, including the U.S. Open, PGA Championship, U.S. Senior Open, Senior PGA Championship, Kemper Open and Quicken Loans National. Maryland has had famous athletes including baseball's Cal Ripken Jr. and Babe Ruth, and Olympic swimming medalists Michael Phelps and Katie Hoff. Since 1962, the official state sport of Maryland is jousting. Lacrosse was named the official team sport in 2004, and Sports Illustrated wrote the sport "has always been the showcase for the flower of Maryland manhood." In 2008, intending to promote physical fitness for all ages, Maryland declared walking the official state exercise and became the first state with an official state exercise. 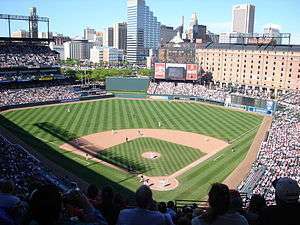 Maryland has major professional sports teams in the city of Baltimore and in the Maryland suburbs of Washington, D.C.. Two major league teams play in Baltimore — the NFL's Baltimore Ravens and MLB's Baltimore Orioles. Additionally, the NFL's Baltimore Colts played in Baltimore from 1953 to 1983 before moving to Indianapolis. 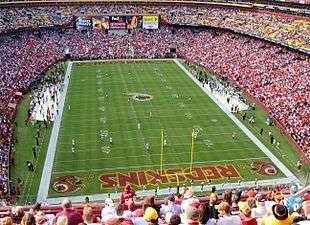 The Washington Redskins play in Landover, Maryland. The NHL's Washington Capitals and the NBA's Washington Wizards used to play in Maryland before moving in 1997 to a newly constructed arena in downtown D.C. The following table details baseball teams which were located in Maryland. For minor league teams that changed affiliations, each affiliation is listed as a separate team. The Johns Hopkins Blue Jays lacrosse team, founded in 1883, is the school's most prominent sports team, which has won 44 national titles and is the only school sport to compete at the NCAA Division I level. 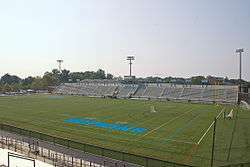 The Blue Jays play at Homewood Field (pictured left). Hopkins women's lacrosse also competes at the Division I level. 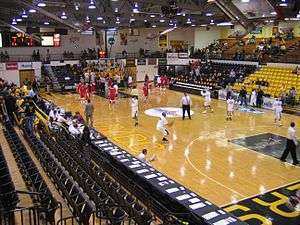 The athletics teams of Towson University participate in the NCAA's Division I and are members of the Colonial Athletic Association as well as the Eastern College Athletic Conference. The school's sports teams are called the Tigers, and the mascot of the University is named Doc. The University of Maryland, Baltimore County sports teams participate in the NCAA's Division I, and is member of the America East Conference. The school's sports teams are called the Retrievers, and the mascot of the University is a Chesapeake Bay Retriever which has been referred to as both True Grit and Fever. The University of Maryland, College Park sports teams participate in NCAA Division I as a member of the Big Ten Conference. Prior to 2014, the school participated in Division I as a member of the Atlantic Coast Conference, of which it was a founding member. Its teams are called the Terrapins, and its mascot is a diamondback terrapin named Testudo. 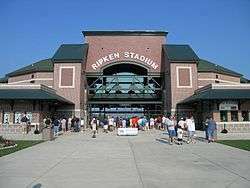 The Cal Ripken Collegiate Baseball League (CRCBL) is a collegiate summer baseball league located in the Washington, D.C. and Baltimore, Maryland metropolitan areas. Of the ten teams in the league, six play home games in Maryland. The Baltimore Catholic League (BCL), is a competitive basketball association composed of private Catholic high schools in the Baltimore, Maryland geographic area. The Interscholastic Athletic Association of Maryland (or IAAM) is a girls’ sports conference for private high schools generally located in the Baltimore metropolitan area but extending to various other regions, including the state's mostly rural Eastern Shore. 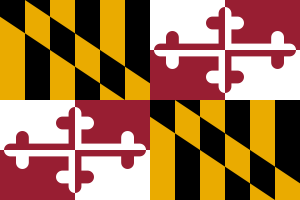 The Maryland Interscholastic Athletic Association (or MIAA) is a boys' sports conference for private high schools generally located in the Baltimore metropolitan area but extending to various other regions, including the state's mostly rural Eastern Shore. The Maryland Public Secondary Schools Athletic Association (MPSSAA) oversees public high school sporting contests in the state of Maryland. MPSSAA member schools City and Poly clash during their annual rivalry game at M&T Bank Stadium in 2007. The Washington Catholic Athletic Conference or WCAC is a high school athletic league for boys, girls, and co-ed Catholic high schools located around and in Washington, D.C., United States. Horse racing has a very long history in Maryland going back to colonial days. The Preakness Stakes, the middle jewel in the Triple Crown, is run at Pimlico Race Course in Baltimore. Presently, Maryland has four Thoroughbred tracks and two Harness Tracks. ↑ "State Symbols". Maryland State Archives. Retrieved 2007-12-06. ↑ Frank Deford, Navy's Star With A Stick; Even in Maryland, where lacrosse enjoys exalted status and local talent is idolized, Jimmy Lewis of New York is hailed as the game's best player, Sports Illustrated, May 30, 1966. ↑ STATE SYMBOLS: Marylanders take a walk, and eat cake too. Retrieved September 30, 2008. 1 2 3 Hoffmann, John (June 24, 1999). "Keys finish first half on a tear; Fall League to fold". The Gazette. Retrieved May 17, 2016. ↑ "Wesley Brown Field House" Facts sheet. USNA Public Affairs Office. Athletics Department webpage (Naval Academy Varsity Athletics official website). Retrieved 2010-02-09. ↑ Club /Intramural Sports Programs. Naval Academy Varsity Athletics official website. Retrieved 2010-02-10. Wikimedia Commons has media related to Sports in Maryland.